I’ve updated our Video page with “my” 10 and 11 year old sunday school children singing Jeremiah 29.13-14a. The music is mine; this is one of our family worship choruses. Because many have asked, I’ve added a new photo album: Shalviah Tzadika (first weeks). A couple of weeks ago, we shared some of the measurable signs of growth in two of the geographic clusters of churches in which we’ve spent the most time. Well, it turns out my information for the Mara North cluster was already outdated. I’ve copied below an excerpt from an email yesterday from William Koya, a church elder who used to be our neighbor (about a 15 minute off-road drive, but easily within walking distance) in Endoinyo Erinka. ……….1. updates of CCC development. About development many people are called to join CHRIST and have been baptized. Between November last year and January this year 196 new people are baptized. Four new churches are planted which two of them have already built semi permanent [buildings]. … For unity they planned to have such men’s meetings three times a year, the second one shall be at Talek 7/6/2014. 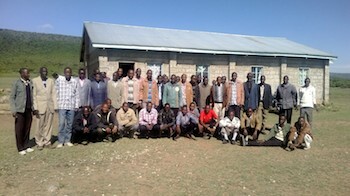 They also want to build a strong relationship between CCC and CMF as partners in CHRIST. Find the attached pictures of the meeting. 2013 was a good year for our churches in Kenya. December was a particularly good month. 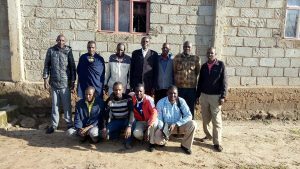 In the Narok Central Cluster of churches alone, there were 3 new church plants plus a fourth that is still underway. On 29 December, 48 new believers were immersed into Jesus within those four congregations. 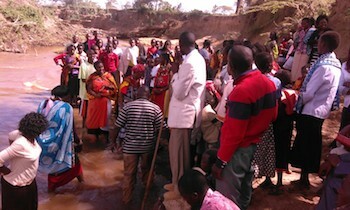 And in the Mara North Cluster, there were 78 baptisms in December. I’ve chosen to share the news from these two clusters because we lived in the Mara North area our first term, and in Narok for the first part of our second term. Do you want to read more? Read the update or see more pictures here. To explore how God has been untangling our hearts, visit Ruth’s new blog, untangled. Rain, rain, inches of rain!